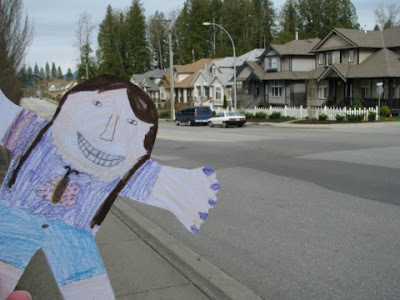 Homeschool Creations: Flat Mary Visited Canada! Our friend Amanda had a lovely visit with Laurianna's Flat Mary and has since sent Flat Mary onto some more friends. 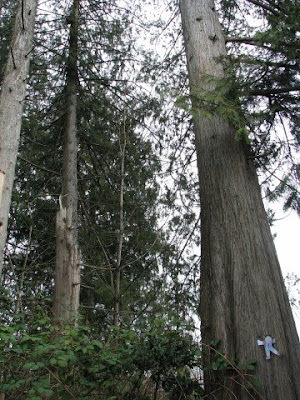 Today, she sent us some of the pictures of Mary's visit to British Columbia. 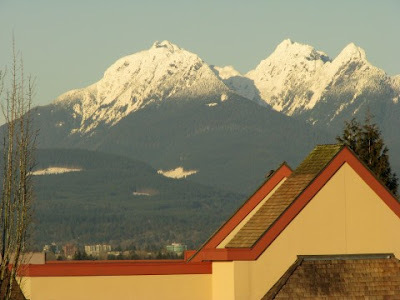 Amanda writes: These are the mountains that mark the top of the Fraser Valley. Aren't they beautiful? October-March they are pretty consistently hidden behind the rain-filled clouds, but they peaked out a few weekends ago, and we tried to snap some pictures. This picture was taken four blocks away at the grocery store, but the sky is filled with mountains like this from west to east when you drive down the street towards my house. Mary showing a picture of where she stayed. Mary had to see some of the local trees. Amanda told us: There are trails throughout the entire commonwealth. They are often behind housing developments, woods, marches, open fields--it's nice. It means there are always public places with nature around them and it makes going for walks great fun. 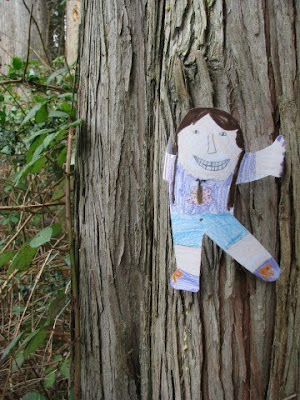 (If you look really close in the first picture, you'll see Flat Mary stuck to the tree on the bottom right hand corner). Thanks so much, Amanda, for being such a lovely hostess to Mary! Looks like Flat Mary is having a great trip! We had some flat friends travel a few years ago, and 2 of them came back with a scrapbook (from my daughter's Nana) from Ireland! What a keepsake!